Mechanical Contractor: Todd Green, Owner, East Texas Refrigeration, Inc. 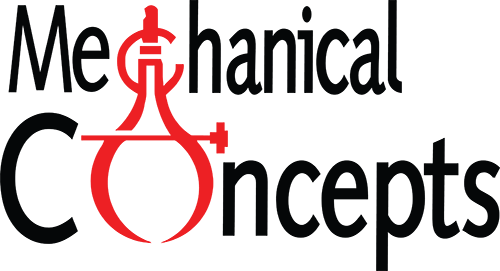 Consulting Engineer: Mike Hazel, Engineer, Aillet, Fenner, Jolly & McClelland, Inc. The outdated and inefficient chiller system requires complete replacement. Additionally, a floor-by-floor installation schedule is required to lessen the disruption for tenants, as well as spread the cost over multiple years. A highly efficient, modern heating and air conditioning system will replace the old chiller system without any modifications to the historical architecture or structural integrity of the building. A unique team effort between the Manufacturer’s Representative, General Contractor, Owner and Architect was required to coordinate the floor-by-floor installation that would not modify the existing architecture. 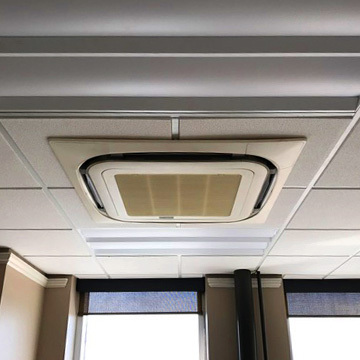 A Daikin Variable Refrigerant Volume heat pump system was installed, primarily with ceiling-mounted cassettes to provide a state-of-the-art HVAC system. 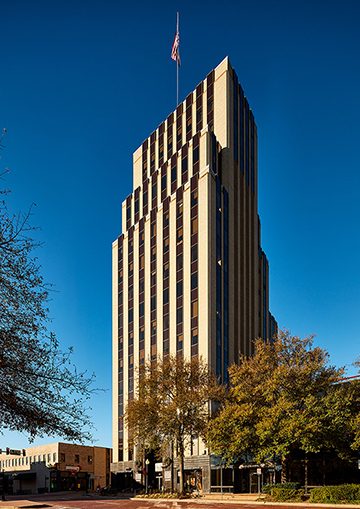 Centrally located in Tyler, Texas, at the west end of the downtown square, the People’s Petroleum Building first opened its doors November 5th, 1932 as the tallest high-rise building in East Texas. Originally named People’s National Bank after its largest tenant, the 1930’s era art-deco office building is a prominent historical landmark that included several oil companies and related businesses that thrived during the East Texas oil boom. Prominent oil businessmen H.L. Hunt and D.K. Caldwell were some of the original tenants. At the time, the 15 story, 85,000 square feet structure was considered one of the largest construction projects west of Mississippi. In 2012 the People’s Petroleum Building was honored with the National Register of Historical Places, and also recognized as a Tyler Historical Landmark. After 70 years, the owners of the historic People’s Petroleum Building were ready to renovate and modernize the structure while maintaining the existing historical art-deco architecture and design. Outside, the original buff brick was restored along with the street level facades of polished black granite that frame the entry. Inside, the building retains the original, grand marble and limestone entrance, a grand art-deco banking lobby, marble-faced elevator entrances, polished aluminum handrails, and timeless, limestone and terrazzo floors. To minimize disruption to the tenants, renovations were completed one floor at a time beginning in 2012. The renovation included a state-of-the-art heating and air-conditioning system. 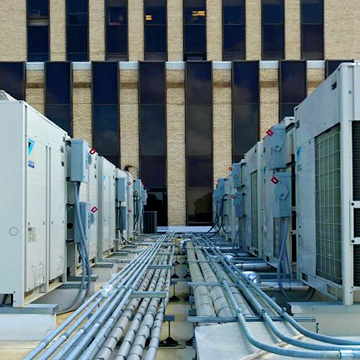 The outdated chilled-water system, installed in 1969, was replaced with an efficient, reliable, and quiet Daikin Variable Refrigerant Volume (VRV) system that will provide many years of controllable comfort for the building’s tenants. From the owner’s perspective, they were looking for a highly efficient system to reduce utility expenses, integrate with their existing Building Management System, save space, maintain the historical architecture, save on annual maintenance expenses, and spread the installation cost over several years as they completed the renovations one floor at a time. All 15 floors of the historical, mixed-use building, including a restaurant, retail and office space, were completed in 2017. 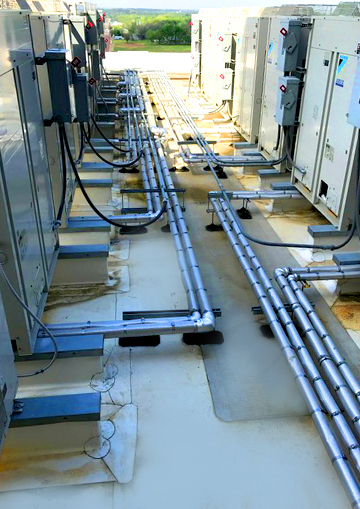 Energy savings between 20-30% and annual maintenance savings of 50% is estimated with the Daikin VRV system when compared to the existing chilled water system. Unobtrusive, ceiling-mounted cassette units were installed flush with the ceiling throughout most of the building. Several ducted concealed and floor standing concealed units were also fitted to hide above ceilings and behind walls as necessary to maintain the original historical interior architecture. A few wall-mounted units were also used for individual, unique spot cooling applications. A Daikin i-Touch Manager control system was installed to integrate the Daikin VRV heat pump system with the Building Management System and individual Navigation Remote Controllers were used to control each zone.